Fruit Fiesta was a three reeled progressive game that made a lot of people much richer. Due to the great popularity of the classic 3-reeled slot, Microgaming decided to transform it into a 5-reeled progressive video slot machine. The game has the same symbols as the 3-reeled game but this time, it has more lines and more winning chances and of course, a better paying progressive jackpot. 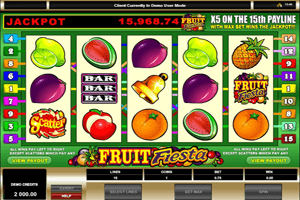 Play Fruit Fiesta Slot here. Fruit Fiesta has 15 lines and 5 reels and on them, players will see multiple fruit symbols including apples, kiwis, oranges, mangos, lemons, watermelons, plums and more. Other symbols include bar symbols, the logo of the game and the fruity scatter bonus symbol. Players can also see the amount of the progressive jackpot right at the top, written in red. The Fruit Fiesta logo is wild, which means that it will substitute for all of the other symbols on the reels and the lines of the game, except the other special icons in order to enable players in creating winning combos to get paid. This logo is also responsible for triggering the progressive jackpot of the game, this happens when 5 of these logos land on the 15th paylines of the slot machine. The Fruity Scatter bonus symbol can give players scattered multiplied rewards when a minimum of 3 scatters land anywhere on the line of the game.